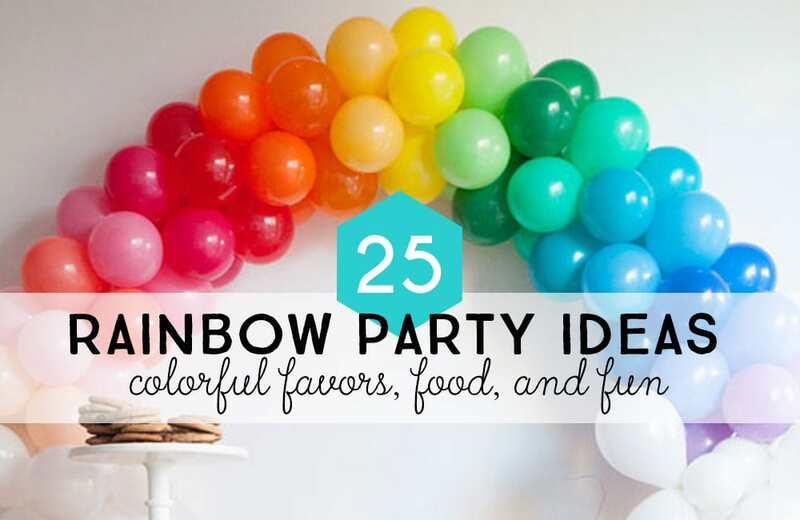 These rainbow party ideas will give you a head start on planning your next colorful get together. 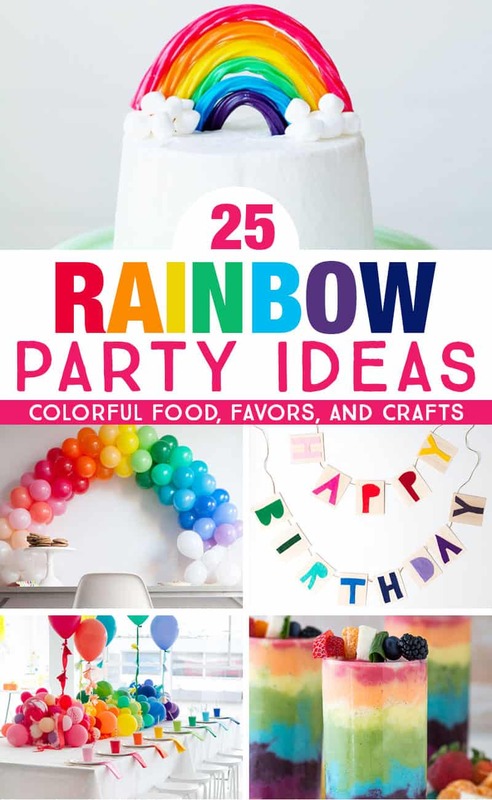 From free printable party invitations to inexpensive DIY party favors, you can put together an amazing rainbow party that will wow your guests without dropping a small fortune. 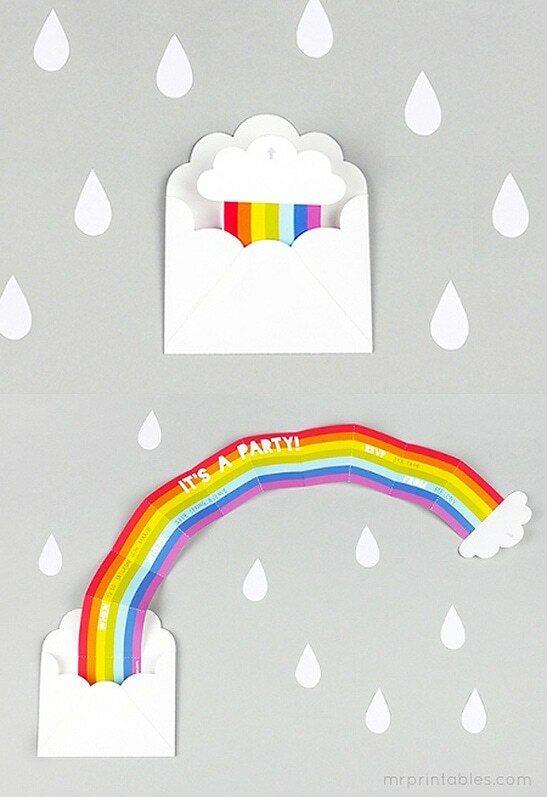 This invitation is a fun surprise for invitees who will open it to find a surprise rainbow awaiting them. See how to make this DIY printable rainbow invitation from Mr. Printables for your next Rainbow Party. Check out Love Stitched for this lovely free party invite with all of the colors of the rainbow. 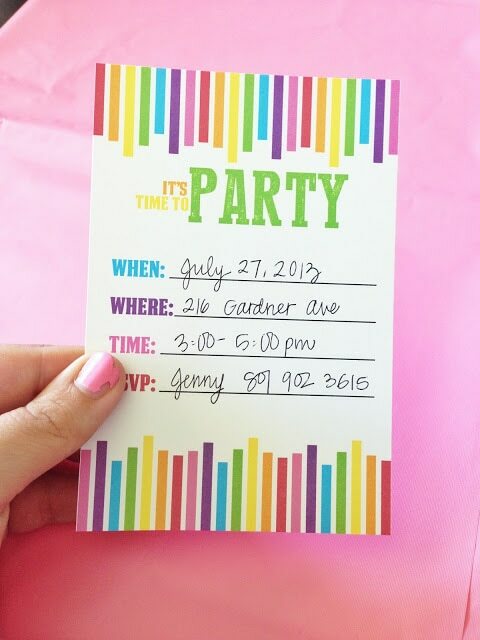 The fill-in the blank style party invitation works for any party and all you need is a printer! 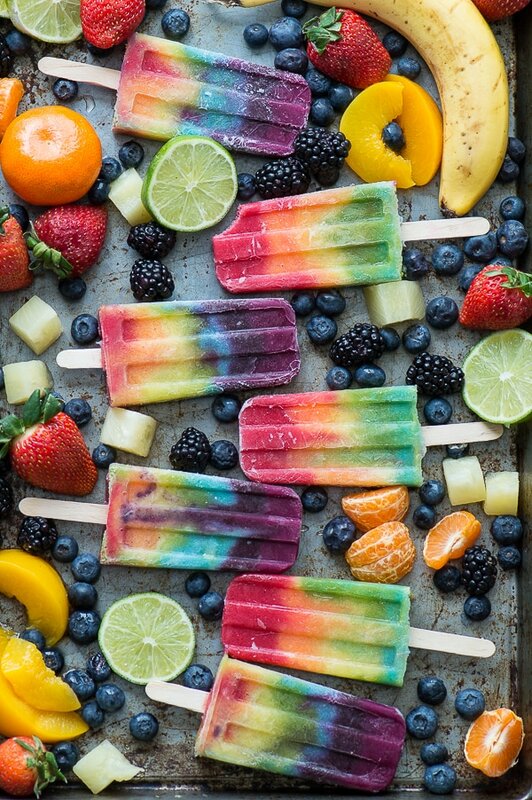 If you’re looking for a cool treat for your rainbow party, check out these gorgeous fresh fruit popsicles that look like little edible rainbows. 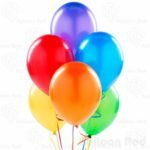 The First Year Blog shows how to make them. 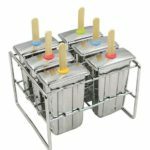 Use this healthy smoothie snack from the First Year Blog to sneak in some nutrition before the kids start getting into the cake and ice cream business of the party. 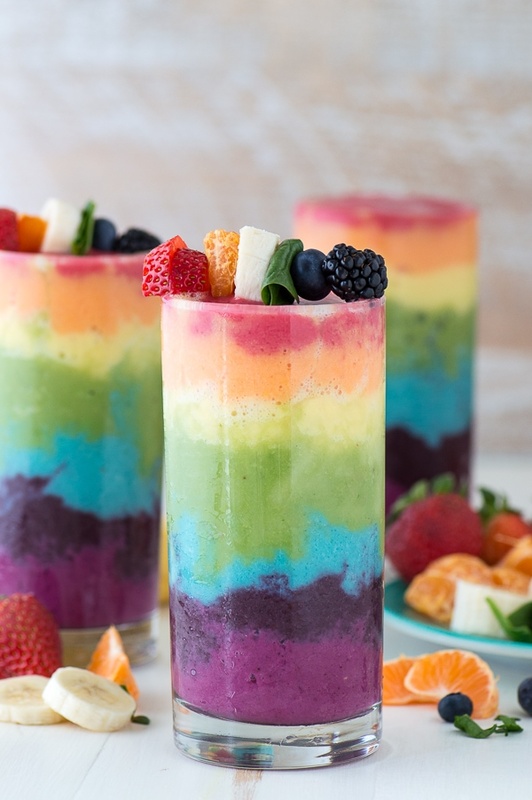 Colorful fresh fruits give these smoothies a burst of color that is perfect for a rainbow party. My favorite party food to include in my party plans is usually impressive to look at, easy to make, and easy to eat with your fingers. Check all of those boxes with this amazing rainbow fruit pizza from Well Plated, which is made from a simple can of crescent rolls and some Greek yoghurt (and the beautiful fruit of course). 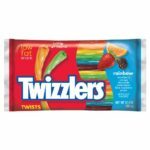 Kids will head straight for these colorful rainbow party snacks. 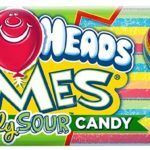 Kristen Duke Photography shows how to assemble the snacks using some simple ingredients and colorful rainbow gummies. 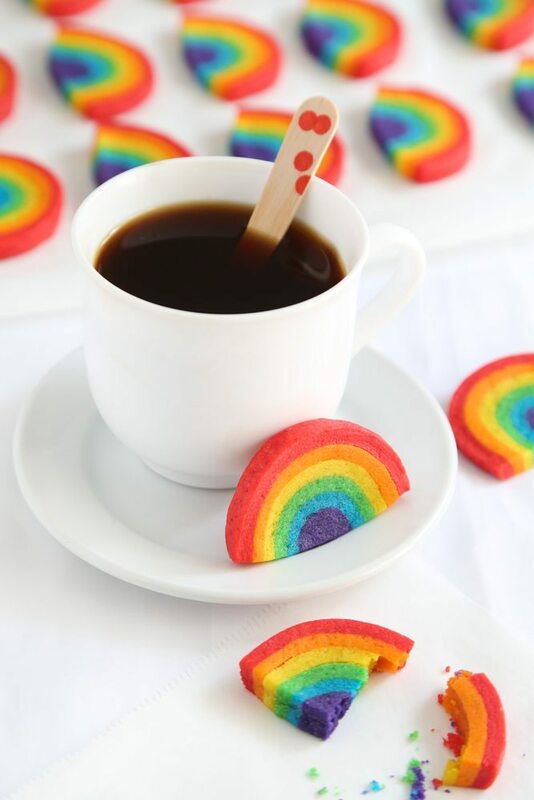 Check out the Etsy Blog for the inside scoop on making bright, colorful rainbow cookies with a rolled sugar cookie recipe and food dye. 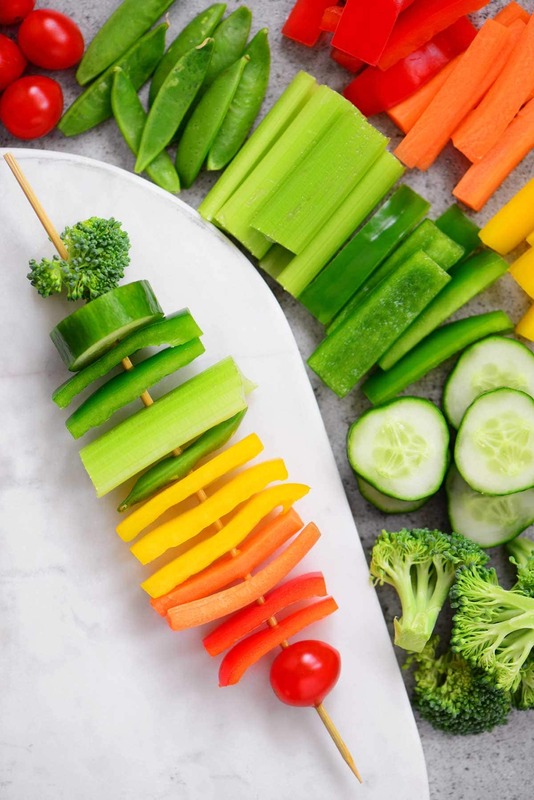 Delicious veggies come in so many bright colors, why not slice some up and skewer them for an eye-catching food display? Throw in a few different dips and I guarantee these won’t last. This idea is from The Gunny Sack and is a wonderful, healthy Rainbow Party food idea. 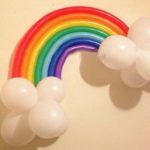 Create a festive rainbow balloon arch for big impact at your Rainbow Party. Oh Happy Day has the details on creating this appealing rainbow arch. 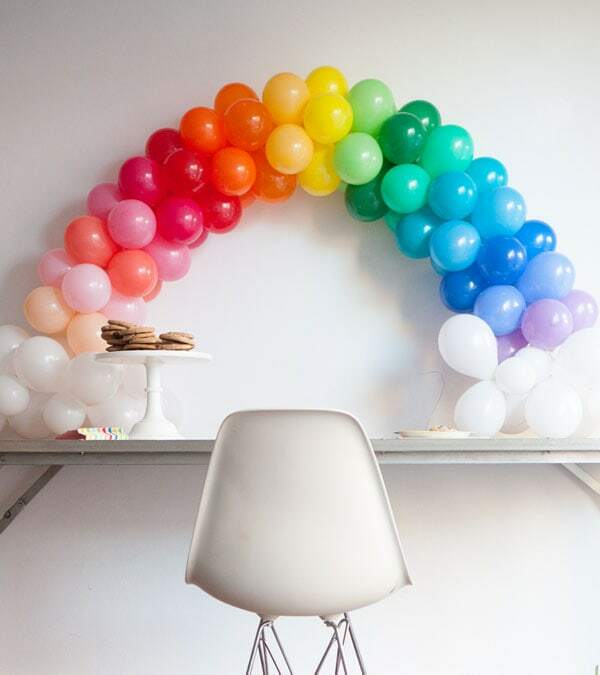 Sometimes a little bit goes a long way, and I think that’s exactly the case with this simple rainbow balloon arch. Follow the tutorial at Birds Party to create a colorful focal point for your dessert table or entryway. 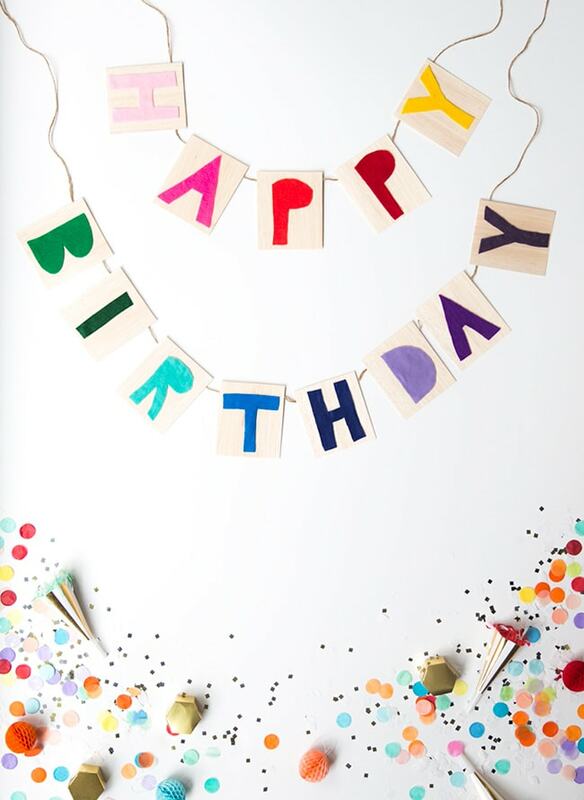 Make this simple and colorful Happy Birthday banner in all of the colors of the rainbow using balsa wood and felt. Project from Say Yes. Colorful Twizzlers and mini marshmallows are all it takes to create this candy rainbow cake topper from The Sweet Lulu Blog. 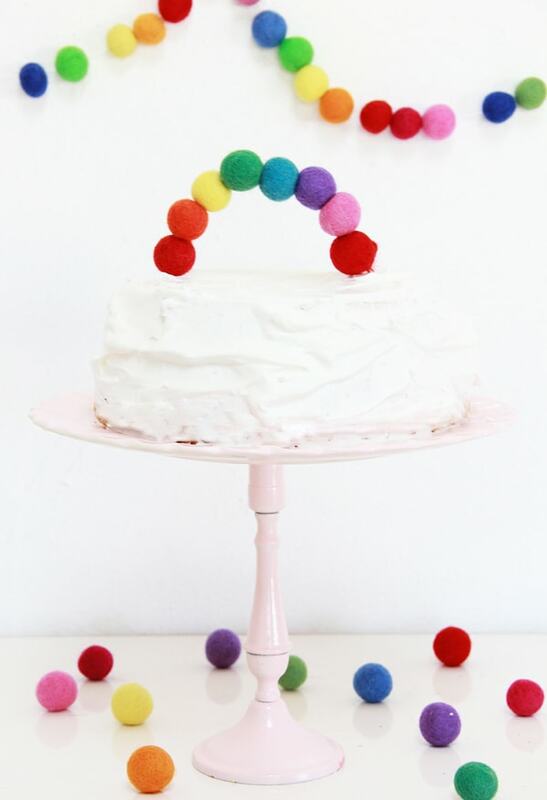 You can make this simple modern rainbow cake topper using felt balls, as shown, or with a similar-sized gum ball using the same method. A Subtle Revelry shares a tutorial for making this cake topper. 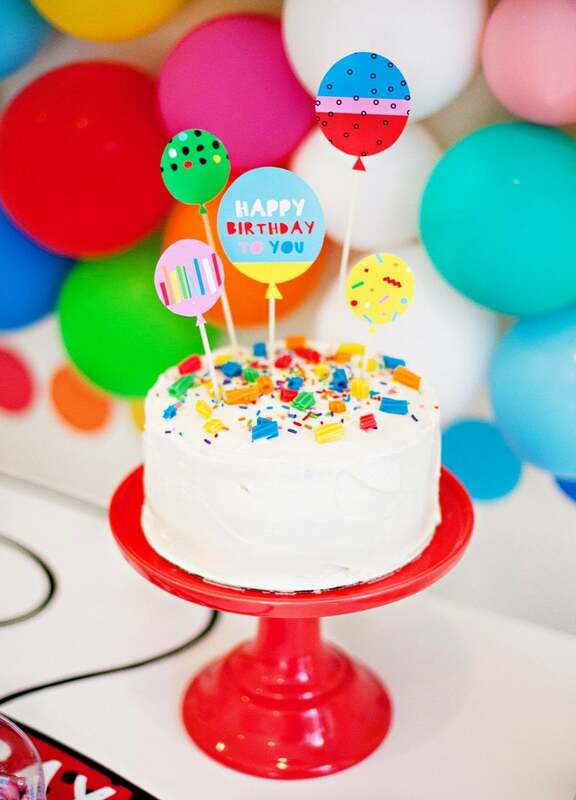 Keep it simple with a printable cake topper for your rainbow party. 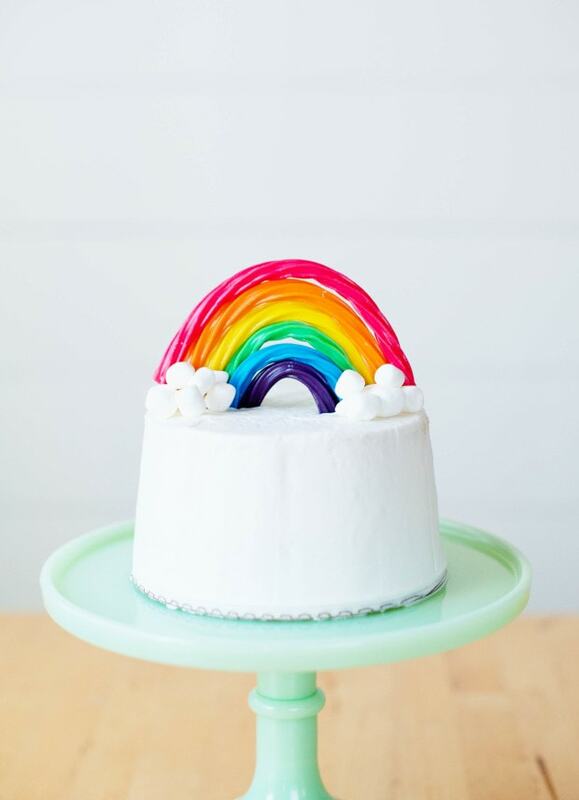 Hostess with the Mostess shares the printable for this easy DIY cake topper, along with a load of other rainbow party printables, such as printable hats and coloring pages. 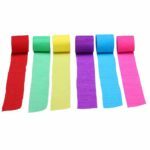 I love this DIY rainbow streamer banner from Laurel’s Little Corner. It’s easy to create and looks amazing! 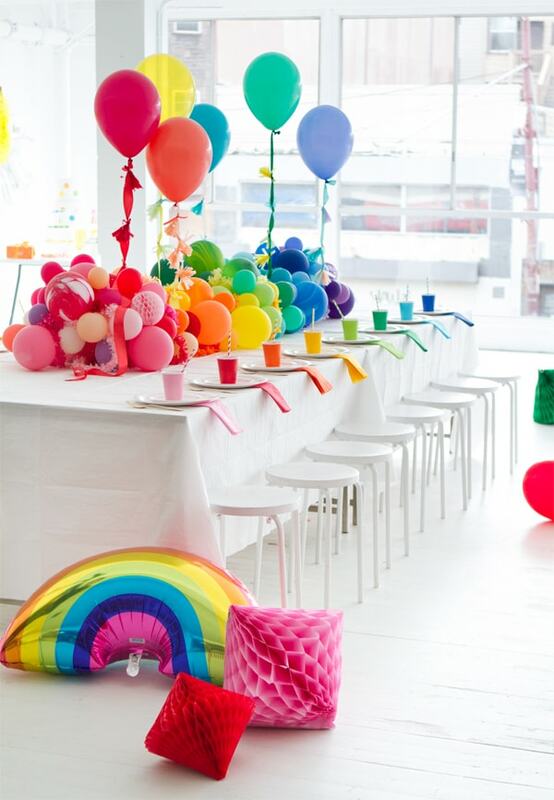 Wow your guests with this bold rainbow balloon table runner and rainbow place settings. You can see how this was made at Oh Happy Day. I know for a fact that these cardboard tube rainbow blowers would be a huge hit at a kids rainbow party. 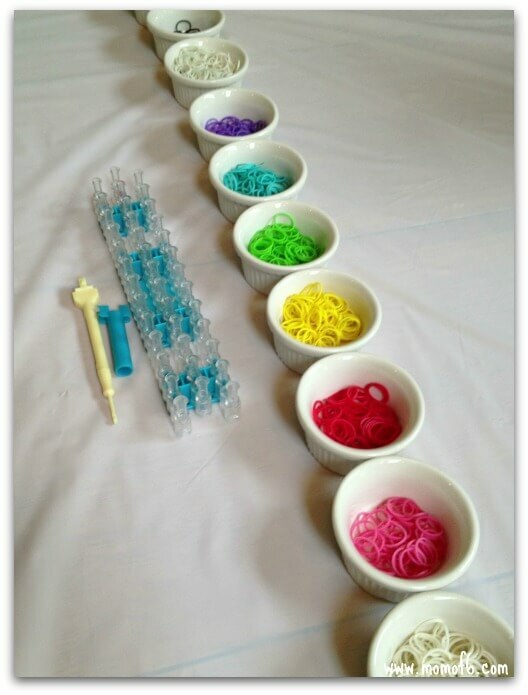 Collect the tubes ahead of time, then let the kids make their own during the party! Details at Kids Craft Room. 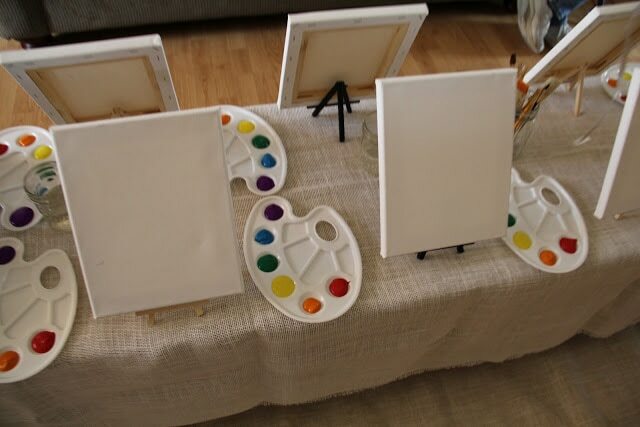 Kids will love having their own paint and easel with canvas to paint. The palettes are pre-filled with bright rainbow colors. 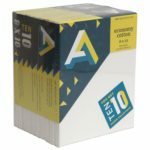 You can find 8X10 canvas sets of 10 for around $16, making this activity still within reach if you’re trying to keep a low budget. 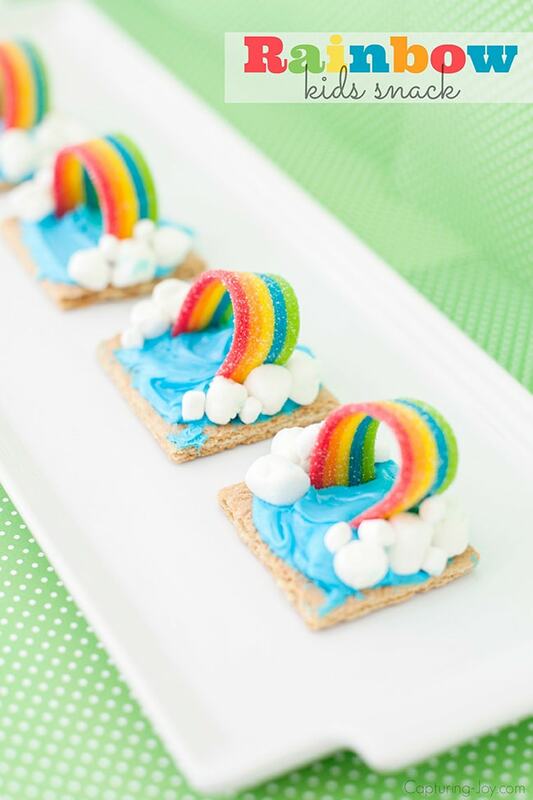 See this and more rainbow party ideas here. 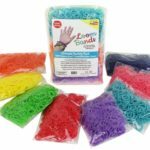 If you’re throwing a rainbow party for elementary aged kids, you can’t go wrong with a rainbow loom activity table. 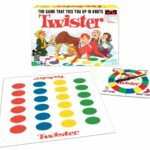 This is great fun that goes perfectly with a rainbow themed party. Details at Mom of 6. 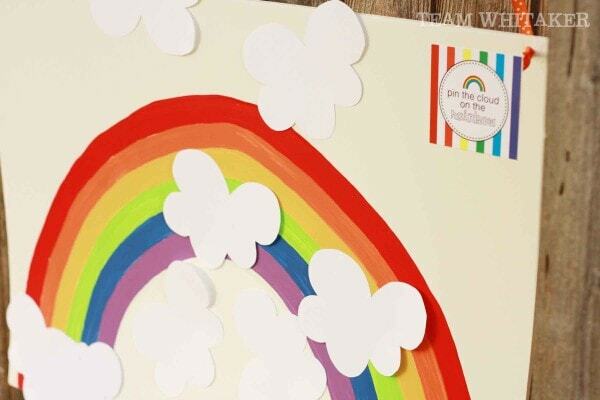 Give a classic party game a rainbow twist with this Pin the Cloud on the Rainbow party game from Team Whitaker. All you need is some poster board and paint to make your own! 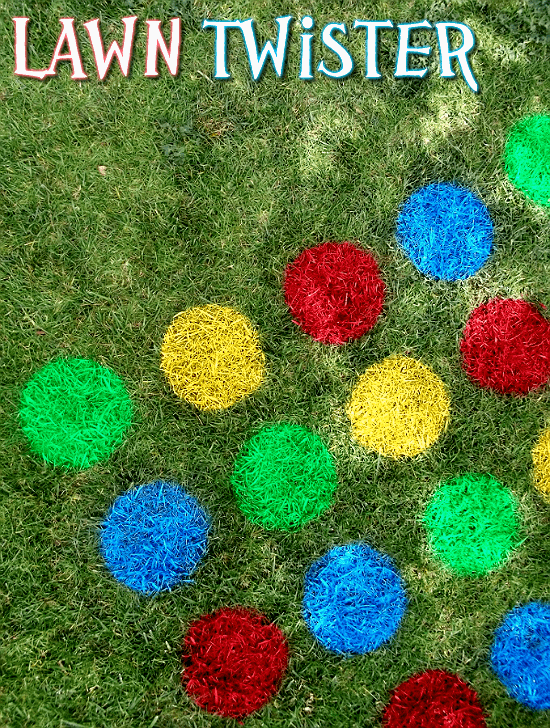 If the weather looks good, pick up some spray paints that won’t harm the grass and make your own Lawn Twister game! 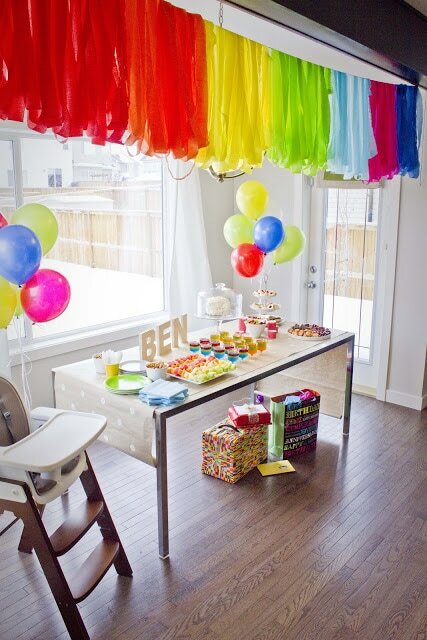 Use bright rainbow colors to keep with your rainbow party theme, and guests will have so much fun with it. Momma Told Me shows how. 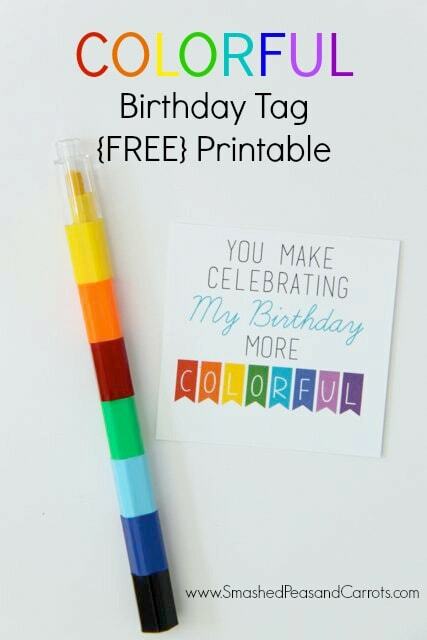 Smashed Peas and Carrots shares a free printable tag for creating some really simple and colorful party favors to give your rainbow party guests. Plus, you can find these ROYGBIV stackable crayons in packs of 10 for $3 at Target. 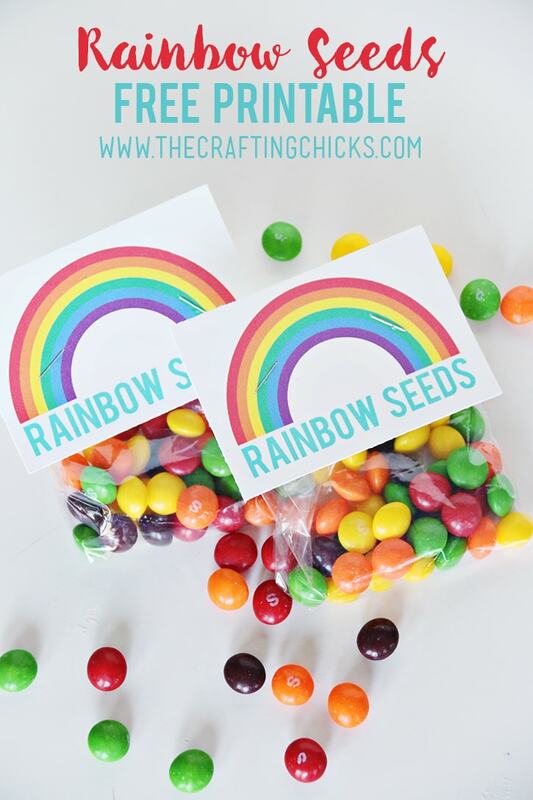 Let kids plant their own rainbows with these adorable Rainbow Seeds party favors. 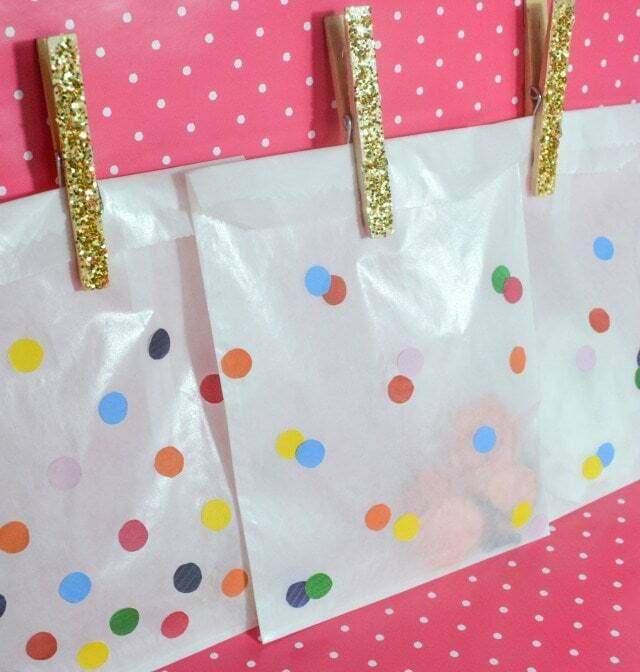 The Crafting Chicks have a free printable to make this a cheap and easy rainbow party idea. 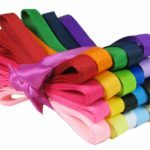 You can make these colorful ribbon rings for kids to use at the party, or send them off as party favor gifts. 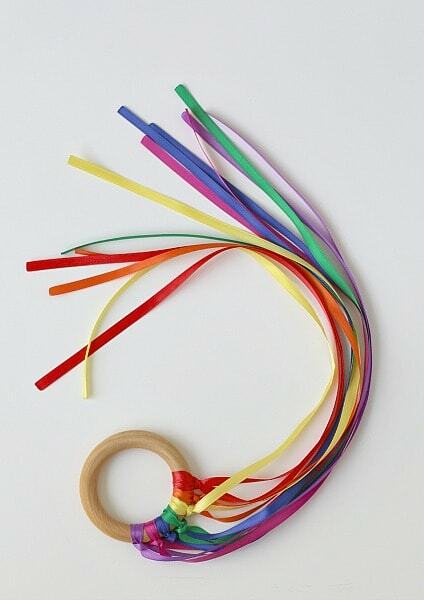 Ribbon rings are irresistible and beg to be twirled around. Buggy and Buddy show how you can make your own. If you’re looking for a colorful way to package up little treats and small party favors, try this simple confetti packaging treatment from A Joyful Riot, complete with a downloadable file for making your own rainbow colored confetti. Follow is tutorial for making your own felt balls for your party decorations. 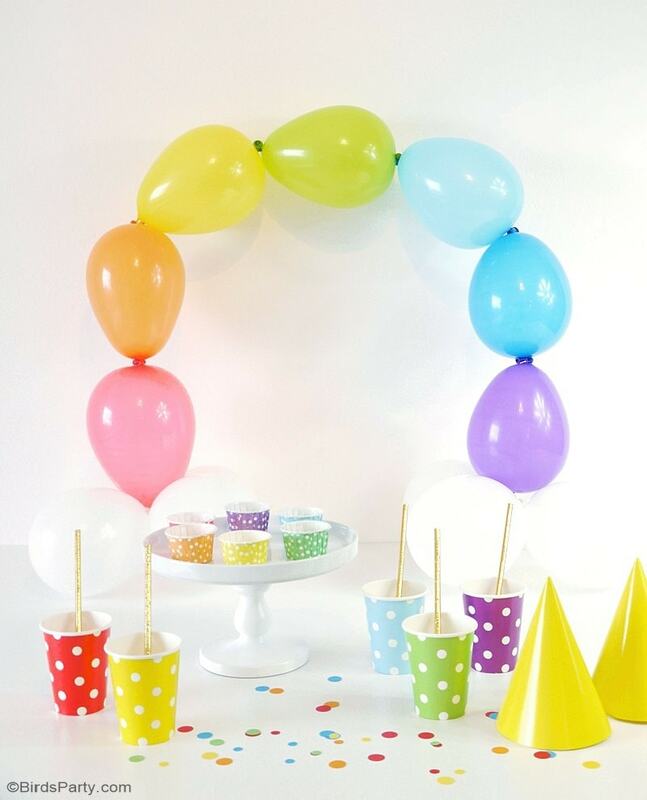 Felt balls like these were used in the cake topper above, plus they make fabulous, colorful garlands! Pin this image to share and save these ideas for later! 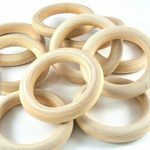 These are Amazon affiliate links, which means if you click on one of the product links, I may receive a small commission.